I detest removing nail polish and most of the time you will either see me picking off the nail polish or waiting until it grows out. I know that this is the worst thing to do but I'm really not exaggerating when I say that I hate doing it, but sometimes you have to give in and remove the old nail polish and if I do like most others I will use a nail polish remover. I don't have a great track record with nail polish remover , imagine 99p removers that remove any smoothness or moisture from your nails. Yes I hate to admit it but I never saw the point in buying a worthwhile nail polish remover and blamed my dry nails on the nail polish. 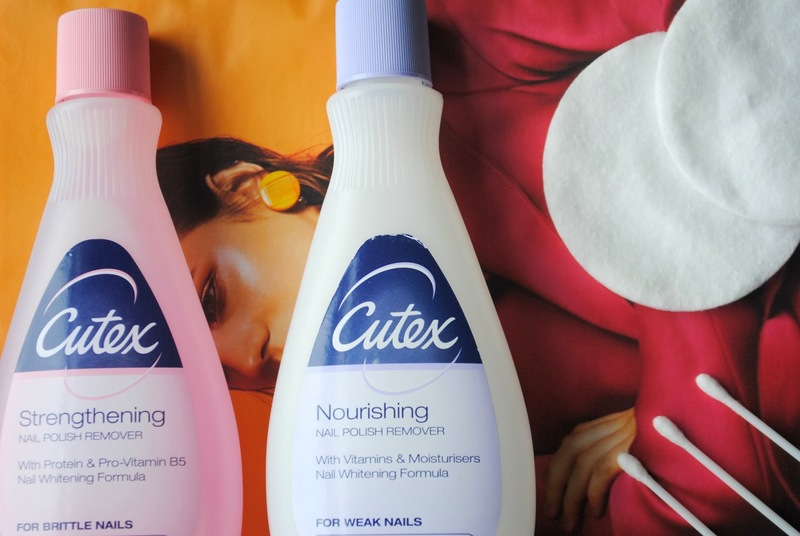 I was fortunate to run out of that nail destroying liquid and purchase a new one , so on my regular trip to Boots I came across the Cutex range. A nail care brand which to me looked fancy compared to my 99p remover. I decided I would give them a go and picked up the strengthening and nourishing remover. The Cutex removers work wonders at removing your polish and adding extra moisture to your nails. The bottle does look quite small but they last so much longer than you would expect and believe me I paint my nails three or four times a week! I am now one not to shy away from the nail polish remover but that still doesn't stop me occasionally picking away at my old polish! I guess old habits are hard to destroy. What do you remove your nail polish with ?